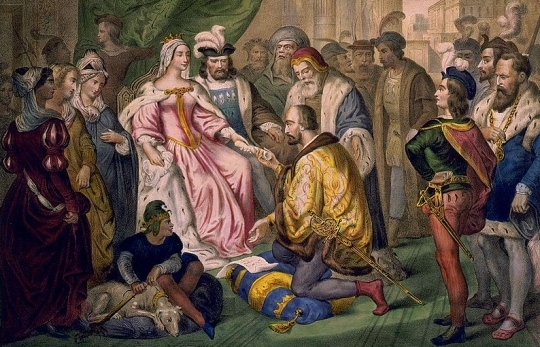 This painting depicts Christopher Columbus kneeling in front of Queen Isabella. There is a big problem with such pronouncements: no historical evidence exists to back up the idea that most people (even uneducated people) in Columbus’s day believed the earth was flat. In addition, there is a wealth of evidence that indicates no one took such an idea seriously. And how the Earth and sea their place should keep; And when the seasons, in their circling course, winter and summer, spring and autumn, each should come, according to well ordered plan; out of a confused heap who didst create this ordered sphere, and from the shapeless mass. The myth that a flat earth was part of Christian doctrine in the Middle Ages appears to have originated with Sir Francis Bacon (1561–1626), who wrongly claimed that geographers had been put on trial for impiety after asserting the contrary. So the church never taught a flat earth, and educated people since the third century BC knew the spherical shape of the earth. Even uneducated sailors understood that the earth must be a sphere, because they knew you that the higher you got above sea level, the farther away you could see the ships that were at sail. Why, then, did Columbus have trouble getting support for his ambitious idea to sail around the world to reach India? Because thanks to Eratosthenes in the second century BC, educated people knew how far he would have to sail to complete the trip, and they didn’t believe such a voyage could be made! The whole story is misleading and mischievous nonsense…The sphericity of the globe was not in question. The issue was the width of the ocean; and therein, the opposition was right. On this Columbus day (or any other day), when you hear someone say that ancient people (or the church) thought the earth was flat, please set them straight. Lies need to be debunked, especially ones that are taught to us in school! For if the world, being made spherical, is confined within the circles of heaven, and the Creator of the world is above the things created, managing that by His providential care of these, what place is there for the second god, or for other gods? Below is a link to a website that lists classical writers who ascribed to a flat earth, including a number of early church leaders who held to that view due mainly to scriptural passages (as with today’s Biblical literalists). They are in the minority, as with today’s literalists, and their views do not reflect official Church teachings. Their viewpoint fell out of disfavor, particularly after 700 CE. Certainly, the spherical nature of the earth was largely accepted several centuries before Columbus. Thanks for the link, Benjamin. The theology listed on the site is, not surprisingly, quite wrong, as the Bible doesn’t even imply that the earth is flat. In addition, the discussion of Basil of Caesarea is not accurate. Basil saw no contradiction between a spherical earth and Scripture, because there isn’t one. He simply said that the shape of the earth has no bearing on theology. There are many writers with whom I am unfamiliar, however, so it will be an interesting resource to investigate. Is it a Myth that Flat Earth Thinking Existed in History?? However, we hope to convey that a flat earth view was not the mainstream view among scholars at all, but probably had a very limited following in pre-medieval times with only a trace in the earliest medieval times represented almost solely by Cosmas Indicopleustes. Contrary to many contemporary writers, we also maintain that many Church Fathers vigorously opposing ‘pagan’ teachings of ancient philosophers were not necessarily promoting the flat earth. It is clear to us that flat earth belief was extremely limited and mostly pre-medieval. The spherical view prevailed and is abundantly represented in works in later medieval times. There are many Biblical passages that mention “ends of the earth” or “four corners of the earth”: Deuteronomy 13:7, 28:64, 33:17, 1Samuel 2:10, Psalms 48:10, 61:2, Proverbs 17:24, 30:4, Isaiah 5:26, 11:12, Jeremiah 25:33, Job 37:3, Matthew 24:31, Revelation 20:8. These are often interpreted as poetic descriptions that should not be taken literally. This, however, presupposes that the ancient writers did not mean a literal sense. Other passages more clearly imply a planar earth: Daniel 4:10-11, Matthew 4:8, Luke 4:5, wherein a tall tree can be seen from the whole earth or the whole earth can be seen from a high mountain. Furthermore, the account of creation only makes sense in the context of Near Eastern cosmology. The Biblical passages make sense only in the face of Near Eastern cosmology, which is that of a flat earth formed out of the watery chaos. That was one of the problems the early church faced. The more learned church fathers took the “scientific,” spherical earth views of Aristotle and talked down their literalist brethren. You are quite wrong about that, Ben. The Bible doesn’t even imply a flat earth. I am sure that the ancient Hebrew conception of the earth was shaped by Near Eastern Cosmology, just as the cosmology of the majority of Christians today is influenced by The Big Bang. However, Near Eastern Cosmology is not in the Bible. The reference to “four corners” has nothing to do with a flat earth. As explained here and many other places, the Hebrew word is “Kanaph,” which means “extremity.” Translating that word to “corner” simply is using the “language of appearance,” which is common even today. When the newspaper reports the time of sunrise and sunset, we don’t accuse the writers of being geocentrists. Indeed, even the term “four corners of the earth” is used to this day, and no one accuses those who use it of being flat-earthers. Daniel 4:10-11 is about a dream. It does not even imply that such a thing actually exists in the natural world. Matthew 4:8 and Luke 4:5 describe an encounter between the Devil and Jesus. It is clearly dealing with supernatural things, not the natural world. The account of creation makes perfect sense in modern terms. There is no need to invoke Near Eastern Cosmology to understand it. This is why people with no knowledge of Near Eastern Cosmology can understand it perfectly. Deuteronomy 5:8 doesn’t have anything to do with Near Eastern Cosmology or a flat earth. It is simply telling people that they should not make idols of what is in the sky, on the earth, or in the seas. Amos 9:6 is not referring to a flat earth. It is part of a vision, and the vision is about God’s Judgement. It has nothing to do with the natural world. The early church faced no problem with natural philosophy. Indeed, that is why a flat earth was the opinion of only a tiny minority in the church. The Bible doesn’t promote a flat earth in any way. Surely ancient people had experience climbing the highest hills and mountains in their locality. But they knew you couldn’t see the whole world from that vantage point. After all, many ancient people travelled widely. Consider the far-flung travels of Abraham and St. Paul. They could also see that rain comes from rainclouds. I think that you are reading modern interpretations into ancient writings. This is like insisting that Thomas Jefferson and Mark Twain were not racist to some degree because in our time this sort of attitude is politically incorrect. We would like to think that they were enlightened human beings, supportive of the civil rights amendment and all that, but the truth is that they were products of their day and progressive as they may have been, their worldviews would probably sound backwards to us today. This is not to say that the Bible actively teaches that the earth is flat, only that the early biblical writers described the world as they understood it at the time. Why else would there be a debate in the early church if this were not so? Benjamin, I think you are reading your interpretation of what ancient people thought into the Bible. I would prefer to read the Bible and see what it teaches. When I do that, I don’t see any hint of a flat earth. I am not trying to think that the ancient people who wrote the Bible were more or less enlightened than we are. I am simply reading what they wrote and seeing what it says. It says nothing about a flat earth. The Flood description is a perfect example of what you are doing. You are assuming that the writers believed that the heavens above and the earth below were surrounded by water. They may have believed that, but I don’t know. However, I can read what they wrote and see that it says nothing about such things. We know that water shoots from hydrothermal vents at the bottom of the ocean. Those could be the “fountains of the deep.” If those fountains were all open, then the waters would, indeed, rise, just as they did in the Flood. There is nothing in the Bible to indicate that the Flood was caused by openings in some firmament. That’s simply you assuming what the ancients meant, based on what you are assuming they believed. Once again, I prefer to read the Bible to see what it teaches, making as few assumptions as possible. There was very little debate in the early church about the shape of the earth. This is clear from the fact that very few early Christian writers tried to suggest it. What little debate did exist was probably caused by the fact that there were some people who believed in a flat earth, independent of what the Bible says. Just as the current Bible-independent opinions of people can cause debate in the church today, I am sure that Bible-independent views caused debate within the church back then. The very fact that few early Christians wrote about a flat earth indicates that the Bible doesn’t teach it. You’re deliberately ignoring the fact that as a matter of observation and experience, people in Bible times could tell that rain came from rain clouds. Likewise, it might look as if the sky rests on mountains, but if you scaled the mountain, you wouldn’t bump your head against the sky. By the same token, it might look like a mountain range marked the end of the world, but many people had occasion to travel beyond the local mountain range. You’re interpreting literary notices without regard to how ancient people actually experienced their environment. Your flat earth/3-story cosmography is simply inconsistent with what people back then were in a position to know. This is an example of what I call deskbound exegesis. You have modern scholars who are out of touch with nature. But ancient people had to be keen observers of nature to survive. This is not ‘my’ opinion. Check out this article which details how some relatively ‘modern’ view the universe: [https://biologos.org/blogs/archive/the-firmament-of-genesis-1-is-solid-but-that%E2%80%99s-not-the-point]. Daniel 4:10 is about a dream. It does not even imply that such a thing actually exists in the natural world. Matthew 4:8 and Luke 4:5 describe an encounter between the Devil and Jesus. It is clearly dealing with supernatural things, not the natural world. Isaiah 11:12 and Revelations 7:1 use the term “four corners,” which I also explained to Benjamin above doesn’t imply a flat earth. It is a common phrase used still today to refer to the four cardinal directions, and people who use it are not referring to a flat earth. They are simply referring to the entire world. There is no reason to think it is being used any differently in Scripture. For me, Isaiah 40:22, and other passages that use the word ‘chuwg’ are really the only interesting passages that allow the OT writers the possibility that they thought the earth was a flat disk. Personally, I’m ok with that. The Bible isn’t a science textbook, and whether ‘chuwg’ means disk or oblate spheroid doesn’t really impact the functional or descriptive intent of the passage in question: God is powerful. The Book of Revelation is an extended vision, like an inspired dream. Based on redundancy fo the responses you have received, Dr. Wile, I wonder if these verses are standard proof texts for people of a certain persuasion. Perhaps not, but the repetition appears mantra-like. If we examine the work of even early- medieval writers, we find that with few exceptions they held a spherical- earth theory. Among the early church fathers, Augustine (354–430), Jerome (d. 420), and Ambrose (d. 420) all agreed that the earth was a sphere…. From the seventh century to the fourteenth, every important medieval thinker concerned about the natural world stated more or less explicitly that the world was a round globe, many of them incorporating Ptolemy’s astronomy and Aristotle’s physics into their work. Thomas Aquinas (d. 1274), for example, followed Aristotle’s proof in demonstrating that the changing positions of the constellations as one moved about on the earth’s surface indicated the spherical shape of the earth. Roger Bacon (d. 1294), in his Opus Maius(ca. 1270), stated that the world was round, that the southern antipodes were inhabited, and that the sun’s passage along the line of the ecliptic affected climates of different parts of the world. Albertus Magnus (d. 1280) agreed with Bacon’s findings, while Michael Scot (d. 1234) “compared the earth, surrounded by water, to the yolk of an egg and the spheres of the universe to the layers of an onion.” Perhaps the most influential were Jean de Sacrobosco, whose De Sphera (ca. 1230) demonstrated that the earth was a globe, and Pierre d’Ailly (1350–1410), archbishop of Cambrai, whose Imago Mundi(written in 1410) discussed the sphericity of the earth.8 Both of these books enjoyed great popularity; Sacrobosco’s book was used as a basic textbook throughout the Middle Ages, while d’Ailly’s book was read by early explorers like Columbus…. With the exception of Cosmas, no medieval writer denied that the earth was spherical—and the Catholic church never took a stand on the issue…. We must rely on reports written by Columbus’s son Fernando and by Bartolemé de las Casas, a Spanish priest who wrote a history of the New World. Both tell us that the learned men at Salamanca were aware of the current debates about the size of the earth, the likelihood of inhabitants in other parts of the world, and the possibility of sailing through the torrid zone at the equator. They challenged Columbus on his claim to having knowledge superior to that of the ancients and on his ability to do what he proposed. They did not, however, deny that the earth was spherical, but rather used its sphericity in their arguments against Columbus, arguing that the round earth was larger than Columbus claimed and that his circumnavigation would take too long to complete…. Those who want to preserve Columbus as an icon for the historic moment when the world became round might appeal to the common people. After all, weren’t Columbus’s sailors afraid of falling off the end of the earth? No, they weren’t. According to Columbus’s diary, the sailors had two specific complaints. First, they expressed concern that the voyage was taking longer than Columbus had promised. Second, they were frightened that, because the wind seemed to blow constantly due west, they would be unable to make the return voyage eastward (33, 34). –From Galileo Goes to Jail and Other Myths about Science and Religion. Ed by Ronald L. Numbers. “Myth 3: That the Medieval Christians Taught that the Earth Was Flat.” Leslie B. Cormack. 28-34. Harvard U. Press; 2009. Those who have written about the nature of the universe have discussed at length the shape of the earth. If it be spherical or cylindrical, if it resemble a disc and is equally rounded in all parts, or if it has the forth of a winnowing basket and is hollow in the middle; all these conjectures have been suggested by cosmographers, each one upsetting that of his predecessor. It will not lead me to give less importance to the creation of the universe, that the servant of God, Moses, is silent as to shapes; he has not said that the earth is a hundred and eighty thousand furlongs in circumference; he has not measured into what extent of air its shadow projects itself whilst the sun revolves around it, nor stated how this shadow, casting itself upon the moon, produces eclipses. –From Basil the Great (Hexaemeron, C. 350 AD). that he had gone round the world on foot, to turn and come back by the same route, when he was only a day’s journey from home, Columbus was acquainted with such stories as this, and also had the astronomical knowledge which almost made him know that the world was round, “and, like a ball, goes spinning in the air.” The difficulty was to persuade other people that, because of this roundness, it would be possible to attain Asia by sailing to the West. Now all the geographers of repute supposed that there was not nearly so large a distance as there proved to be, in truth, between Europe and Asia. Thus, in the geography of Ptolemy, which was the standard book at that time, one hundred and thirty five degrees, a little more than one third of the earth’s circumference, is given to the space between the extreme eastern part of the Indies and the Canary Islands. In fact, as we now know, the distance is one hundred and eighty degrees, half the world’s circumference. Had Columbus believed there was any such immense distance, he would never have undertaken his voyage. Almost all the detailed knowledge of the Indies which the people of his time had, was given by the explorations of Marco Polo, a Venetian traveler of the thirteenth century, whose book had long been in the possession of European readers. It is a very entertaining book now, and may well be recommended to young people who like stories of adventure. Marco Polo had visited the court of the Great Khan of Tartary at Pekin, the prince who brought the Chinese Empire into very much the condition in which it now is. He had, also, given accounts of Japan or Cipango, which he had himself never visited. Columbus knew, therefore, that, well east of the Indies, was the island of Cipango, and he aimed at that island, because he supposed that that was the nearest point to Europe, as in fact it is. –From: Hale, Edward Everett. The Life Of Christopher Columbus From His Own Letters And Journals– : And–Other Documents Of His Time. n.p. : Project Gutenberg, n.d. eBook Collection (EBSCOhost). Web. 13 Nov. 2012. Thanks for those excellent quotes, Carl. As far as the repeated verses are concerned, I don’t know if they are part of some standard “proof text” mantra. However, they are almost certainly the result of someone not investigating the issue much. “The physicist proves the earth to be round by one means, the astronomer by another: for the latter proves this by means of mathematics, e.g. by the shapes of eclipses, or something of the sort; while the former proves it by means of physics, e.g. by the movement of heavy bodies towards the centre, and so forth.” (Question 54: The distinction of habits, Article 2, Reply to objection 2). Yet as soon as the sun is at the horizon, the whole hemisphere is illuminated from end to end. … Secondly, as to place, for in one hemisphere there was light, in the other darkness. To take another example, consider fishermen. Say they live in a coastal village. Suppose these are “primitive,” prescientific fishermen. Even so, don’t they pay attention to the weather before they set sail? Do they go fishing when the skies are full of dark lowering clouds? Or do they go fishing on a clear sunny day? If they thought the sky was a dam that kept water back, except when sluice-gates were opened, rain would be utterly unpredictable. It could rain at any moment, on a clear sunny day. If rain was thought to come from the sky rather than the clouds, then it both could and would rain on cloudless days. A downpour could occur literally out of the blue. But, of course, fishermen know from experience that that isn’t the case. Their life depends on it. It’s dangerous to venture miles into the open sea with stormclouds on the horizon, much less right overhead. It’s completely unrealistic to imagine that ancient people didn’t notice these things. There is a difference between the ‘phenomenon’ of rain and the ‘explanation’ for the rain. As you point out, people can certainly observe that the appearance of a certain type of cloud presages rain and plan accordingly. This does not mean that they know where the rain comes from besides that it comes down from the sky through the clouds, just as a child can recognize the danger of fire without knowing the mechanics of combustion. Take a container of water and throw the water up into the air. Does it stay in the air? Of course not. Human experience tells us that water is heavier than air. Doesn’t rain fall down and not up? Remember that a scientifically naïve culture does not know about ‘water vapor’. They may observe that boiling water makes it look something like a cloud but then it disappears (turns into air. Remember the earth-water-fire-air theory?). So a cloud must be something that is lighter than air in order to remain up there, and the rain cannot be in the clouds because water is heavier than air and would drag the clouds down to earth. So how do we go about explaining where rain comes from? This is what we mean when we speak of ‘cosmogony’—an explanation for how and why things came to be. We know that the ocean looks blue and the sky looks blue too so maybe there is water up there somewhere that escapes somehow to come down as rain. (Remember that scientifically naïve peoples do not know about refraction and reflection and will take it for granted that water is blue.) But something’s got to be holding back that water otherwise it would be coming down all the time. That’s where the idea of a barrier came from, as an attempted explanation for water that comes down from the sky (sometimes torrentially) but that just can’t simply be floating up there. Egyptian cosmogony has the body of the goddess Nut as a barrier between the order of our world and the surrounding chaos. The Babylonians had Tiamat, the ancient embodiment of the primordial waters, whose body forms the vault of heaven. The ancient Hebrews did away with the ‘bodies’ (and gods) altogether and postulated a ‘firmament’ between the world and the waters above, through the actions of one God. The cosmogonies of more than a few cultures have the universe arising out of some chaotic watery domain. The Creator brings order to this chaos, producing our world as we know it. Some similarities run through Genesis. In Gen. 1:2, the spirit of God moves (or hovers) over the waters. What waters? Apparently it is this same primordial, universe-encompassing ocean that other ancient peoples envisioned. There is no world because God has yet to form it. In verses 6-7, God makes a firmament to divide “the waters from the waters,” the waters below the firmament from the waters above the firmament. The firmament is in the midst of these waters. In verses 9-10, God makes dry land beneath the firmament but there are still waters above the firmament and the surrounding universe. Think about turning a cup over onto a plate and sinking the whole thing into a bathtub full of water. There is air inside the overturned cup which keeps the area on the plate (beneath the cup) dry. The cup (firmament) keeps the area ‘safe’ from the surrounding waters. This was a widespread (though not necessarily universal) belief in the ancient Near East. And it was logically consistent within their experience. Ancient peoples were not stupid–they just didn’t have the storehouse of accumulated science which we take for granted and which colors our viewpoints. They used the knowledge available to them to come up with a consistent explanatory framework (a theory) to make sense of their world. But as the article I have already linked to you clearly demonstrates, Benjamin, trying to force that belief into Genesis “…is based on a faulty analysis of the Hebrew linguistics.” It might have been a popular belief at the time (although the article by Noel K. Weeks I mentioned previously calls that into question), but it is not consistent with Genesis. Did ancient people never notice that it only rains on cloudy days? Never when the sky is clear? Did they never make the connection? And it’s more than inference. There are times when you can see rainclouds on the horizon. Above the clouds, the sky is bright and clear. You can actually see rain coming from the clouds. It’s not coming from the sky through the clouds. The clouds are emitting the rain. The sky above the clouds is clear. The sky below the clouds is dark, due to rain. You can see the sheets of rain at a distance, from an eye-level viewpoint. They obscure the sky behind the clouds and under the clouds, until the clouds dissipate. There’s no rain between the sky and the clouds. Only rain beneath the clouds. Likewise, you can be outside as rainclouds approach. At first it’s clear and dry overhead. When, however, the clouds are overhead, it begins to rain. Do you really think ancient people were so clueless that they never made these elementary connections? A lot of modern people are simply unobservant because they don’t live in the wild. Even if they go for a nature walk, they are glued to the display on their smartphones. And when “scientifically naive” people looked up at the sky, did they see the body of a naked woman overhead? Why does it not occur to you that that depiction is intentionally anthropomorphic? The creation of the world begins in v1, not v2. My arguments aren’t based on modern scientific knowledge, but on what any attentive, prescientific observer would be in a position to experience or notice. A few final thoughts on this topic, Dr. Wile, and thank you for your patience. I trust you are not saying that the ancient writers had hydrothermal vents in mind when they penned the phrase “fountains of the deep.” I think it is more likely that they were informed by their own worldview, namely that of a flat expanse of land surrounded by mountains which held up a solid firmament. The Hebrew word for the firmament is raqia’ which translates as something that is ‘spread out’ or ‘beaten out’ as in shaping metal. Here is a well-cited article which explores this topic. See [https://faculty.gordon.edu/hu/bi/ted_hildebrandt/otesources/01-genesis/text/articles-books/seely-firmament-wtj.htm]. The firmament was imagined as a solid, metallic bowl that maintained a dry earth under the surrounding expanse of water. See HarperCollins Bible Dictionary entry: [http://www.bibleodyssey.org/HarperCollinsBibleDictionary/f/firmament.aspx] and also the Anchor Bible Dictionary entry “Cosmogony, Cosmology”. Bear in mind that this is not ‘my’ lowly opinion, but that of the scholars who have studied the context within which the Bible was written. Benjamin, I am not saying anything about what the ancient writers had in mind, because there is no way to know that. I am just discussing what the Bible teaches, and it teaches nothing about a flat earth, a flat expanse of land surrounded by mountains which held up a solid firmament, etc. The “fountains of the deep” could easily refer to hydrothermal vents. It could also refer to some other fountains in the ocean. I would suggest this well-cited article, which indicates the firmament doesn’t refer to anything solid. Indeed, as the article indicates, one of the most important commentaries ever written on the first five books of Scripture defines firmament as “to stretch, to spread out, then beat or tread out…the spreading out of air, which surrounds the earth as an atmosphere.” As the article clearly shows, the Bible uses the term to refer to the atmosphere, not some odd, solid dome. As these two articles (and many others) clearly demonstrate, the fact that the firmament as mentioned in the Bible is not some odd, solid dome isn’t ‘my’ lowly opinion, but that of the scholars who have studied the original language and understand it better than you or me. Thank you DR.Wile for this excellent information. I’m wondering if this recent discovery might explain the fountains of the deep? I am not sure that it does, Keith. The water is locked up in a mineral called ringwoodite. I am not sure how it could be released quickly enough to produce the effects of the “fountains of the deep.” Of course, there is a lot of stuff we don’t understand about what’s going on in the mantle, so I could easily be wrong. Unfortunately, atheists and their allies in BioLogos basically think that ancient people were stupid. That is so true, Dr. Sarfati. In fact, there is reason to believe they were smarter than we are today.